While parallel and perpendicular lines will be the primary focus of this chapter, there are other types of lines. 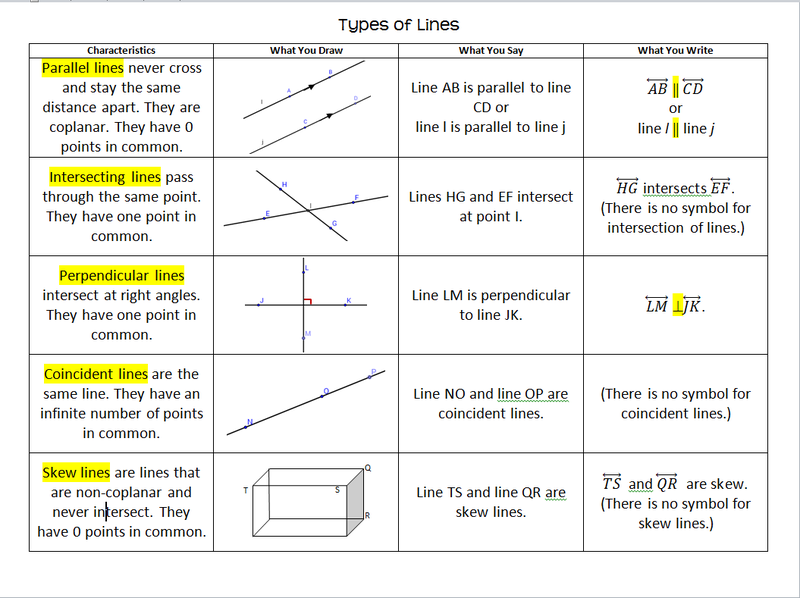 Use the Types of Lines Foldable to distinguish between them. 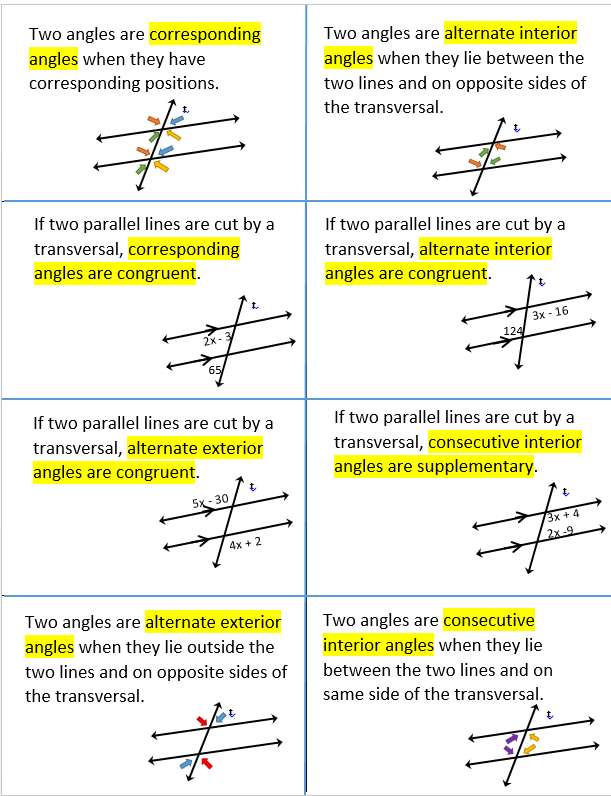 When two lines are cut by a transversal, there are special names for the angles formed by the transversal and the lines. 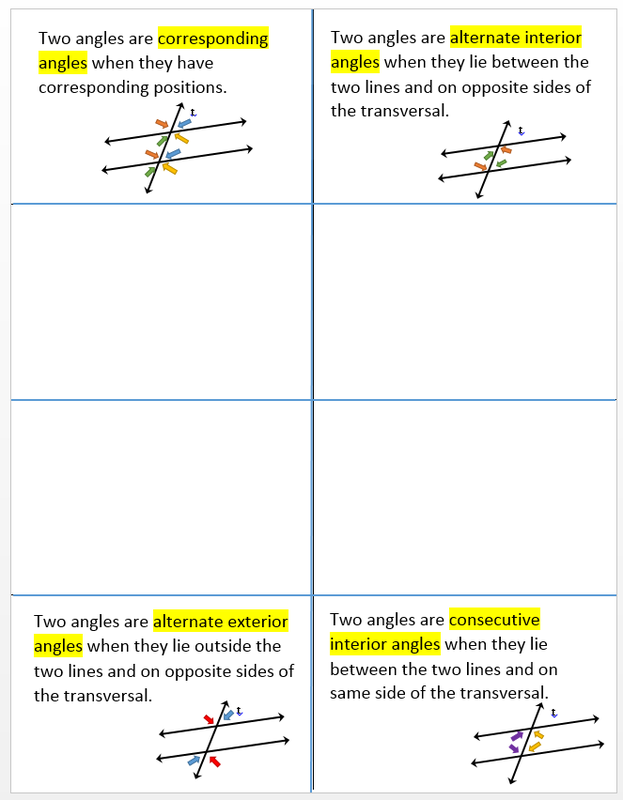 Use the Angles Formed by Transversal Foldable to master the vocabulary. Have students use Geogebra to construct two parallel lines and a traversal. They then identify and measure corresponding, alternate interior, alternate exterior, and consecutive interior angles and make conjectures. Exploring Parallel Lines and a Transversal download. 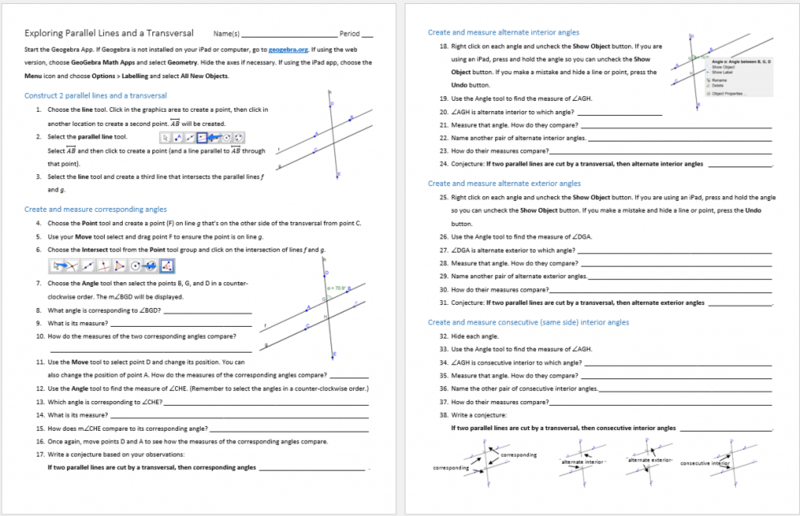 Use the Geogebra activity below to explore the relationships between the special angles above when the lines that are cut by the transversal are parallel. The Geogebra activity below helps underscore the fact that the distance from a point to a line is the length of the perpendicular segment from the point to the line. 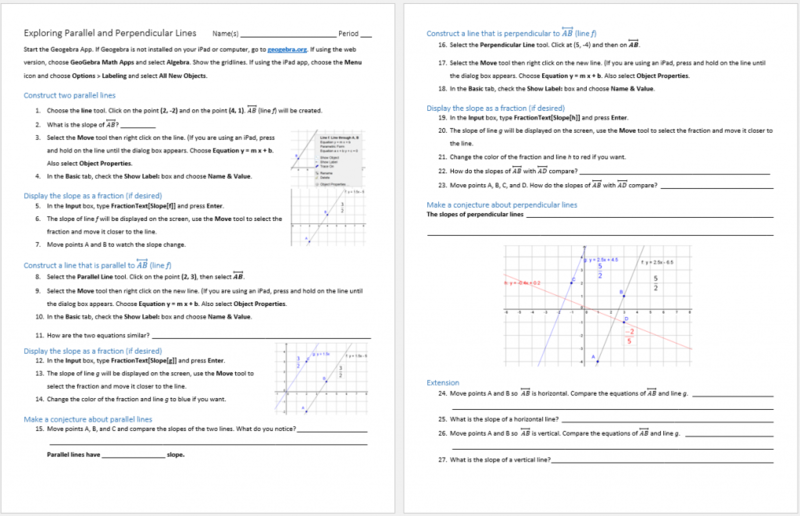 Exploring Parallel and Perpendicular Lines Geogebra Activity will be used to learn how the slopes of parallel and perpendicular lines are related. Exploring Parallel and Perpendicular Lines Pencil Paper Activity will be used to learn how the slopes of parallel and perpendicular lines are related for those who don’t want to use technology. 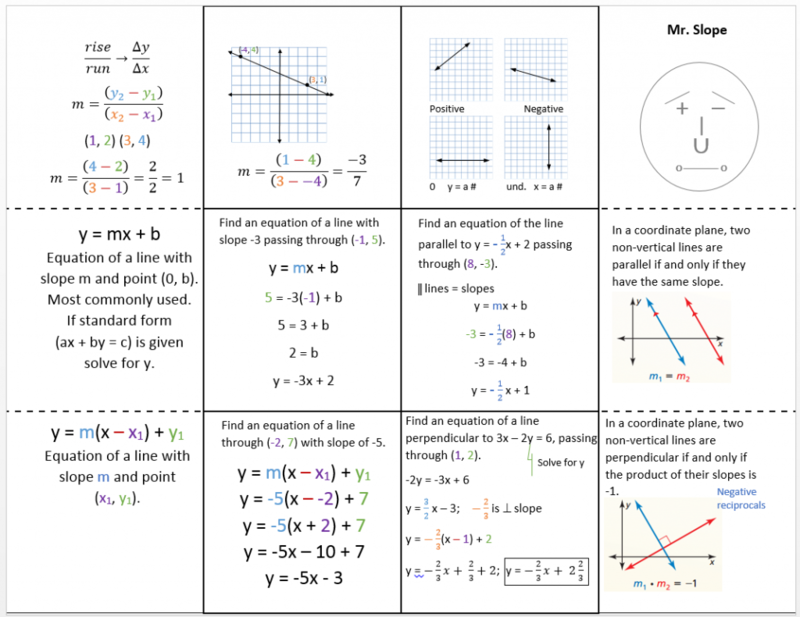 The All About Slope Foldable can help you calculate slope given two points, find an equation in slope y-intercept form, use point slope form to find equations, and includes the relationships between parallel and perpendicular lines and their slopes. When the inside is complete it will look similar to this. A shout out to Mr. Fjelstrom for his Mr. Slope inspiration. Thanks so much for the wonderful website! Could you give me some more information on how to fold the Angles Formed by a Transversal Foldable? I am confused on how it fits and folds together. Absolutely! Copy the pages (1 and 2 if they aren’t filling them out or 2 and 3 if they are) back to back. Orient the paper so the words “Two angles are Corresponding angles when…” are in the top left corner. Fold top down and bottom up so they meet in the middle. 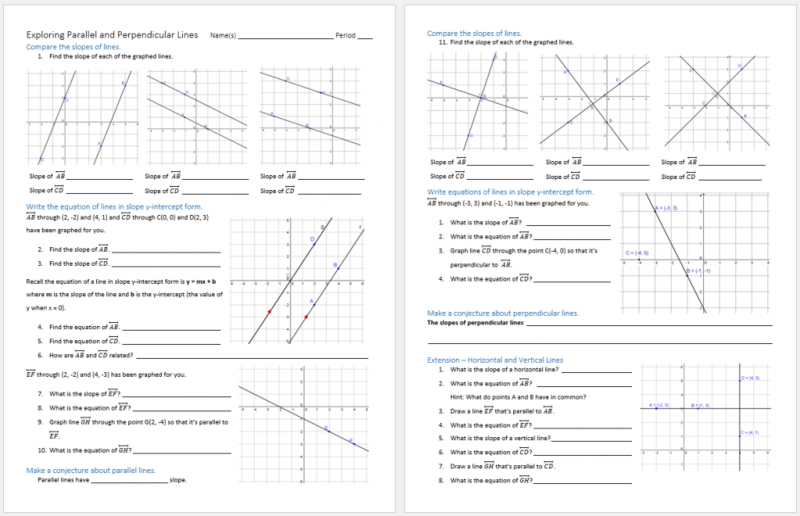 If your students choose to, they can cut a slit vertically in the middle up and down so they can lift the flap of each type of angle pair separately, but my students don’t usually head over to grab a pair of scissors. I hope this helps!